- 05 night accommodation at hotel in Cairo on bed and breakfast basis. - Any items which is not included above. Upon arrival at Cairo International Airport- meet & assist. A.M. Full day tour visiting: Pyramids and the Sphinx - Step pyramids of Sakkara- * Optional Sound and light Show at Pyramids area"
A.M. Full da City tour visiting : The Egyptian Museum, The Citadel, Mohamed Ali Mosque, the Old Coptic Churches in Old Cairo "About Serga and the Hanging Church " & Synagogue. A.M Over day trip to Alexandria visiting Roman Amphitheatre, from outside view to the "Pompeys Pillar and the Qait-bay Fortress - Great library of Alexandria. Sea food Lunch at local Restaurant overlooking the Sea. back to Cairo - overnight at hotel in Cairo. 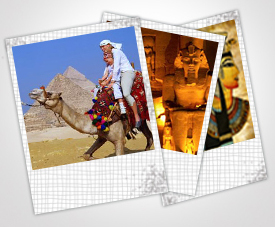 Check-out and transfer to Cairo Airport for your flight to Luxor. Arrival Luxor Airport and transfer to embark your 4 nights / 5 days Nile Cruise. 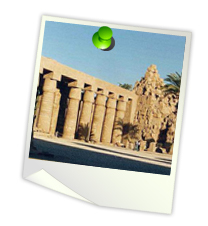 P.M. visit the East Bank ; Karnak and Luxor Temples. A.M. Drive to Luxor to Start West Bank Tour & visit the Valley of the Kings, Hatshepsut Temple and Colossi of Memnon. A.M. Sail to Edfu and overnight on board. Sail to Kom-Ombo and visit Kom Ombo Temple. Sail to Aswan and overnight on board . A.M Visit High Dam, Phyla Temple. Afternoon sailing by Felucca around the islands & view to Agh Khan Moslem . Optional/ Abu Simbel Excursion by air or by van Check-out and transfer to Aswan Airport for your flight to Cairo. Arrival Cairo Airport and transfer to hotel. Check-in and overnight at hotel.